Want to get into the Halloween spirit? Looking to score some great free comics? Then make sure you hit your local comic book store this Saturday, October 25th, for Halloween Comicfest, where you can score a horrifyingly good assortment of free comic books. This year's offerings include a pair of classic Marvel Comics, a special edition of Batman: Legend of the Dark Knight, a Batman/Scooby-Doo team-up, issues of The Walking Dead, Buffy the Vampire Slayer, Ghostbusters, Hellboy, Hellraiser, and more. 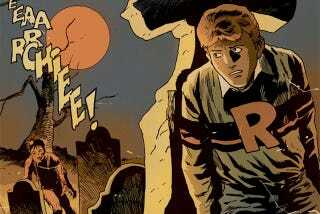 But most of all, if you haven't read any issues of Afterlife with Archie yet, then you definitely need to pick up its free issue, because this comic is so damn good. I know you have an expectation of what an Archie comic is, and I assure you Afterlife is totally, mind-blowingly different. And this Saturday, it's free. You have no excuses, all right? So head here to the official site and enter your zip code to see where the closest participating comics shop near you is.